The debate about health care reform has calmed but decision makers in Oregon say reform will have a negative impact on the country, on their company or organization, and on the cost and quality of health care. These are key findings in a recent CFM/Oregon Business INPUT survey among 923 decision makers. Health care reform was unpopular among Oregon business decision makers who opposed the reform plan by nearly a two to one margin, 31 percent favor to 57 percent opposed. Opposition was based on several factors. It was widely perceived, national health care reform was poor public policy. More specifically, 48 percent say reform will be bad for their company or organization. 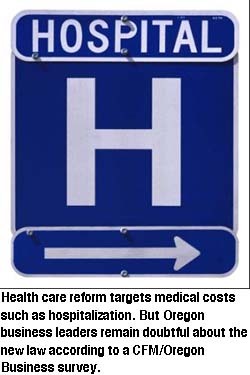 There also were concerns about what impact reform would have the quality and cost of health care. 52 percent say the quality of health care will decline, as a result of reform. Health care reform is now the law. Starting now and through 2018 various features of the legislative will go into effect. Apparently, supporters of the reform have their work cut out to convince decision-makers in Oregon health care reform will provide benefits in the long term. The online survey was conducted in April 2010 among 923 Oregon Business magazine subscribers.